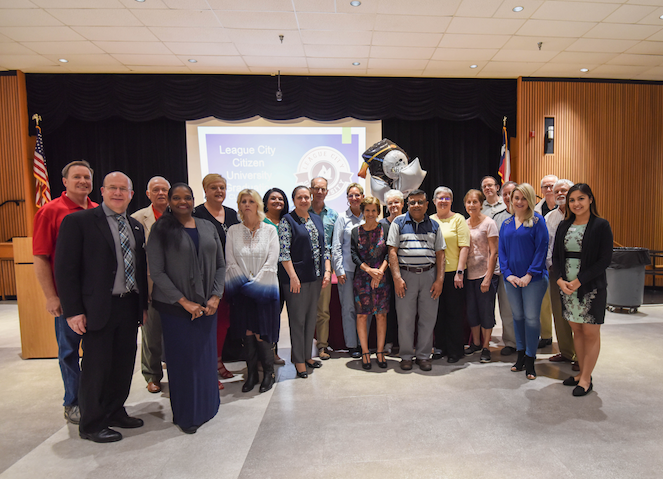 Registration is now open for League City’s Citizen University, a program geared to help residents learn more about their local government. Citizen University was launched in 2015 to familiarize community membersand local business owners with the purpose, processes, and structure of the city’s government so they can becomeactive participants in municipal operations. The Fall 2018 session will be held over a 10-week period every Thursday from 7 to 9 p.m. beginning on October 4, 2018. Each session will include an interactive presentation from city staff on various city services, issues and an understanding of how residents play a crucial role in leading League City into the future. Participants will also get an opportunity to visit and get tours of different City facilities. • Not currently holding a position as an elected official or running for office during class session. A background check is required for admission to the program because the course will include a tour of the Public Safety Building. ⇐Previous Volunteers Needed for Guinness World Record AttemptNext⇒ Election Candidate filing closes Monday, August 20 at 5 p.m.